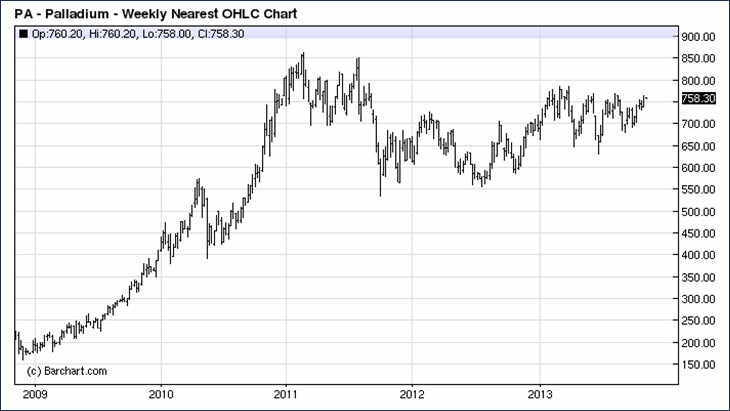 Platinum: Today’s ‘Rich Man’s Gold’ Palladium: Tomorrow’s? The Platinum Group Metals (PGMs) are a family comprised of 6 metals — platinum, palladium rhodium, iridium, osmium and ruthenium. But for our purpose today (and for most investors), we are only interested in the first two — platinum and palladium. That relationship has reverted to its historical norm, and at this writing platinum now trades for better than a $150 premium to gold. Interestingly, during the 40 years before the 2008 financial crisis, platinum traded at a premium to gold of between 30% and 180%. Since then prices for the two have become much more closely correlated. What’s also true is that platinum (and palladium) being such relatively small markets, have demonstrated the potential for being much more volatile on both the upside and the downside compared to gold. Over the last couple of years, we have paid more than the usual amount of attention to this evolving precious metals ‘sidebar’ story. We have extensively covered an intriguing Canadian project via on site/video interview visits, as well as issuing special reports/company analyses in The Morgan Report — all available to subscribers on the silver-investor.com site. First is the overall size of the platinum/palladium market. 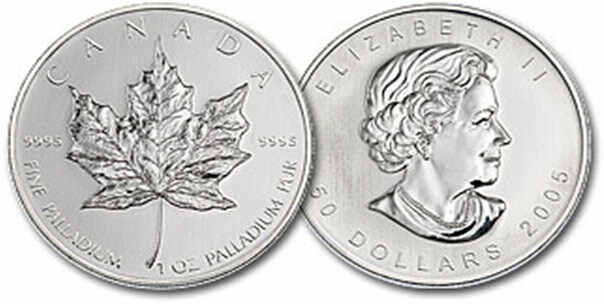 Like silver, the PGMs can be thought of as ‘two-doors metals”. That is they have industrial, as well as investment demand. A strong case can be made that both of these demand components have the potential to grow substantially going forward. If, compared to other investment vehicles like bonds, real estate, tech and bio stocks, the gold and silver markets (including mining shares) are small, the platinum market is tiny — and Palladium’s is infinitesimal! The world supply of platinum is about one-tenth that of gold; less than one-hundredth that of silver. (It’s been stated that all the platinum ever mined would fit into an average American living room.) Whereas during the 1980’s and ‘90’s above ground inventories were largely in surplus, since 1996 net reduction has swung this picture into the deficit column. Russia and South Africa alone account for around 86% of global platinum production — which has been declining for both since 2006. North America and Zimbabwe supply 4% each, with “Others’ making up the remainder. As overall production struggles, recycling plays a key role in filling the gaps. Demand components: Auto industry (catalytic converters — generally for gas burning engines) 30%; Jewelry 28%; Industrial uses 35%; Investment c. 8%. 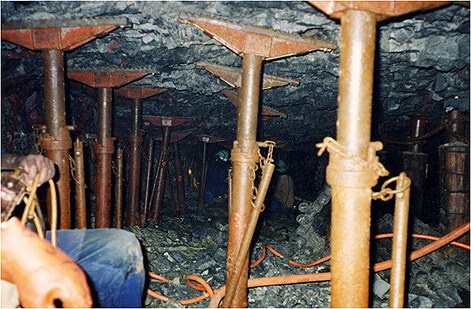 It’s estimated there are over 5 billion ounces of above ground gold, compared to about 200 million ounces of platinum. Unlike gold, there are no large stockpiles. So while the metals in nature are equally rare, annual platinum mined equates to only a small fraction of that for gold. 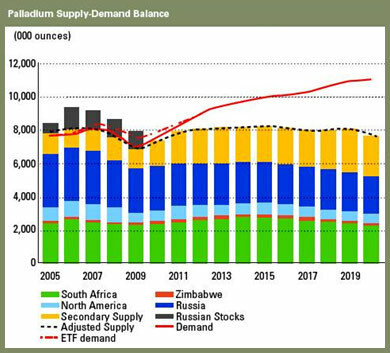 Indeed, for 2012, Johnson Matthey reported that platinum supply was approximately 8.5 Moz (mining 6.5 + recycling 2 .0 Moz respectively). For palladium, supply was about 7.4 Moz. In comparison, global gold production was around 2,500 metric tons or a bit over 80 million troy ounces. 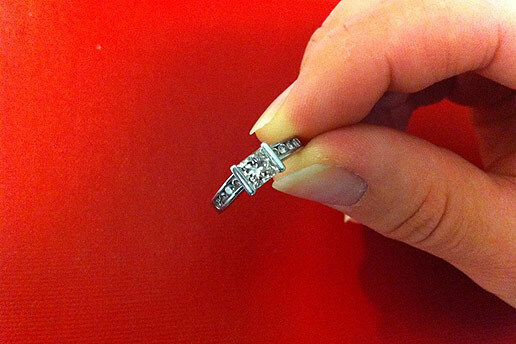 For a number of applications, platinum is actually more favored by jewelers than gold. It is 10% more dense extremely durable and does not need to be ‘enhanced’ with other metals, as gold does, e.g. in the creation of ‘white gold’. To express certain attributes in its fabrication, gold needs to be combined with palladium, nickel or rhodium. Though platinum was only officially discovered in the 1700’s (the Spaniards ran into it in the 1500’s while mining for gold and silver in the New World), ancient indigenous South Americans used it in ceremonial jewelry. Still farther back in history, caskets in ancient Egypt have been found adorned with gold, silver — and platinum. Not known to exist in Canada until 1888, it was discovered in Sudbury, Ontario, alongside copper and nickel deposits. Sometime thereafter, until the early 1950’s Canada was actually the world’s largest platinum producer, before being supplanted by South Africa. Now consider that palladium is 15 times rarer than platinum. Often found as a byproduct of platinum, around 68% of its annual supply is used in the automotive industry in catalytic converters (preferred for diesel engines). An additional 4% goes into jewelry, 7-8% for dental, 14 % for electrical and 8% to “Other”. 40% of the world’s palladium supply comes from a single location in Russia (Norilsk), though several North American mines produce it as well. Platinum and palladium are so critical in many industrial uses that Japan has designated PGMs to be one of the most important metal categories in its national resource acquisition policy. Palladium-containing components are used in an array of electronic devices. It is utilized in a new type of composite metallic glass, called “DH3”, under development by the California Institute of Technology. Benefiting from palladium’s “high bulk to shear ratio” it is reputed to be as tough as steel. It is a component in some fuel cells, and is in demand from the healthcare industry in dentistry and medicine. A process using palladium nanoparticles has been developed, enabling synthesized drug delivery to precise locations inside the human body. This brief discussion would not be complete in my view, if we did not examine what happened to the palladium market in the early 2000’s. We had clear evidence of an industrial driven demand taking the price sky high in “panic” buying. At the time, Ford Motor Company and others were moving from platinum to using the less expensive palladium in catalytic converters, in order to save money. This physical demand by Ford drove the palladium price to approximately $1100 per ounce! Furthermore clear evidence of how the paper and the physical price were able to separate greatly. In order to stay in the Futures Market (the paper game) contract holders were required to put up 2X the physical price! Yes, you read that correctly — you had to pay twice the amount of the physical delivery price, in order to keep your paper claim! Obviously the exchange wanted as many traders as possible out of the paper market! This is brought to your attention, because few people know of these facts and many have asked me over the years if this will (or could) happen in the silver market. To that question, let me simply state—we already saw it take place in one of the other white metals — so be prepared! Platinum and Palladium generally trade in a reasonably identifiable price ratio with each other, but on occasion, they are fully capable — as the charts below demonstrate — of creating solo price surge moon shots. They tend to rise alongside increasing gold and silver prices too, but here again they can make large moves on their own. 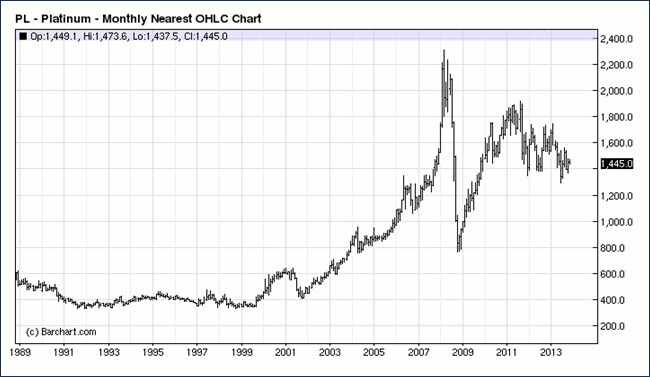 Palladium — Currently, First Among Equals? As you look at chart formations of ‘the big four’ precious metals, which seems to have the best looking pattern these days? I’d say — palladium. An Exchange Traded Fund (ETF) is a security that tracks an index, commodity or basket of assets. As a category, these products, including ETNs and various trust-type vehicles are generally referred to as Exchange Traded Products (ETPs). Most people probably assume that resource sector ETP holders are either individual investors, or managers of hedge and investment funds. However, in addition to being merely an investment vehicle, it is conceivable that physical metals’ supplies could — and are — being accumulated for eventual use within a given country as part of a strategic reserve. Confirming this premise, a Mitsubishi Corp official has been quoted as stating, “In a broader sense (ETFs), allow Japan to accumulate a stockpile of physical precious metals domestically by storing them in warehouses designated by MC within the country”. The rise of gold and silver ETFs, especially GLD and SLV respectively, have had a significant effect on the price of precious metals over the last decade. What we’ve seen happen with available supplies of gold and silver is now in the process of taking place with platinum and palladium. Several ETFs have been created to purchase and hold the PGMs. Earlier this year in just 6 months, an ETF set up in South Africa, took over 150,000 ounces of platinum off the market. A possible palladium choice is the ETFS Physical Palladium Shares (NYSE: PALL), with good liquidity, trading as much as 50 — 80,000 shares/day. Another example is the Sprott Physical Platinum and Palladium Trust (NYSE Arca: SPPP), an exchange-traded investment alternative (ETP) to holding the physical metals. The trust purchases palladium and platinum in equal dollar amounts, resulting in a 2:1 Pd/Pt ratio. This is a closed end fund, which can trade at a premium or a discount to its net asset value (NAV), since, unlike an ETF, it does not “rebalance” itself in real time. At Silver-Investor.com we like the story of how the early Spaniards dealt with platinum when they first ran across it in alluvial deposits in nugget form — which for platinum is rather uncommon since it is normally found in association with other metals. They named it “platina” — ‘little silver’ and tossed it back, presumably to mature and become more silver-like later on. Of course, we now call it “platinum”.